Time to put on my "Taft Hat" and educate all you ignorant, uninformed readers today (that's just the hat talking - I love you guys. Don't hate me! It's not E.S., it's the TAFT!). Everyone ready to be talked down to? Nation, today we're going to be talking about voters shopping their franchise around, looking for a good fit. We all know that we sometimes get frustrated with the party we've traditionally supported - they're avoiding an issue we personally care about, their leader says something monumentally stupid, or they (allegedly) siphon millions of dollars in government advertising contracts to their friends in Montreal. Now, in order to more fully understand what we're talking about today, I had to find a graphic that illustrated, in the simplest terms possible, the political spectrum in Alberta. I couldn't find one - so I made one. Anyone over the age of 25 will recall the simple, 2 dimensional line, with "Left" and "Right" marked - a reference to the historical seating arrangement of some French parliament in-between surrenders (if memory serves - Gr. 6 Social Studies was a long time ago). In the time since, that simple spectrum has been replaced by a 2 axis spectrum, factoring in differences between social and fiscal policy. That one was going to be WAY too complicated to a) make, and b) explain, so I went back to the spectrum we all grew up with. Clearly, my job with the government of Alberta isn't in graphic design. Now, a short explaination of what you're seeing here... We've got the traditional Left and Right designations, with the centre marked... well, in the middle. We've then got Alberta's 4 main political parties plotted out on the Canadian spectrum. 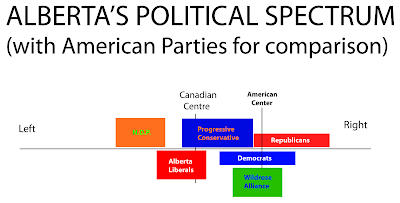 To give us the benefit of context, I've also placed the 2 major American parties (which we hear about almost as often as our own) as they would appear on the Canadian spectrum, along with a marking for what to the American public is the "center", but which to us Canadians is right smack dab in the middle of the old Reform Party platform. The parties are represented by boxes of the party's primary colour. The box for the Progressive Conservatives is slightly larger than the other Albertan parties - this is no accident. As the party in power for the past 35+ years, the PC's have become a VERY big tent. People who, in any other electoral region would be Liberals or members of the Wildrose Alliance, or a completely different party altogether, are members of the PC's as a matter of convenience - can't influence policy if you're not in government. So, since the beliefs of PC members range from the centre-left ("Red Tories") to the far right ("Ted Morton") on the Canadian scale, the range - and therefore, the PC box - is bigger than the other parties. You'll see the Democrats and Republicans have bigger boxes, too - on account that they try to encapsule most main-stream Americans into one of 2 parties, so their range by their nature needs to be large enough to do the job. Most of a party's membership has beliefs that plot at or very near the horizontal centre of their box... The core of the Alberta Liberals, for example, sits at about the same spot as the furthest left a Red Tory can get without feeling a need to leave his party. So, in effect, a VERY Red Tory is probably going to have an exceptional number of beliefs in common with your average Alberta Liberal. Likewise, your average member of the Wildrose Alliance is likely very close, philosophically, with PC members on the far right of their party. Your average U.S. Democrat probably has a lot of policies in common with a very liberal Republican (but, the average Democrat is STILL way off to the right of the average Canadian, and would probably find the Alberta PC's - and maybe even the Wildrose Alliance - too socialist for their taste. But enough about the spectrum - we can debate that until the cows come home. What we're talking about is when voters shop their franchise around... where do they go? What do they consider? Some voters suffer from a serious lack of options. The first thing that most politicians will tell you after a few wobbly pops is that voters will, almost exclusively, only consider moving their vote to a party that "overlaps" their first choice on the chart below. A disgruntled PC, then, could go with the Liberals or with the Alliance, depending on which way they leaned WITHIN the PC's. Likewise, a Liberal upset with their party or their local candidate could go with the NDP, but all things being equal would likely be more comfortable voting for a centre-left Red Tory PC candidate. The voters who run into trouble are the Far Left NDP voters (on the far left even within their own party) and the Far Right Wildrose Alliance types (who would still be considered "moderate Republicans"). If they move parties, it will likely be off the scale of major parties, and into the fringes. NO NDP member, no matter HOW upset they get with their party, is going to go and vote for the Wildrose Alliance, except maybe on a dare. The leaders know this, and work to make their party as tantalizing as possible for the shoppers - it helps that they know where those shoppers are likely coming from. Most middle-of-the-road Liberals, then, tend to favour the PC's as a second choice on a provincial level. Only those on the far left of the party, or very motivated to keep the local Tory out of office, would give their vote to the NDP. Likewise, the far right wing of the NDP might be able to hold its nose and vote Liberal, but most would not - hence the acrimony between those 2 parties in this campaign, as they fight over each other's fringe, knowing thier cores have little in common. Your main pack Tory, likewise, has a couple of choices on election day if he decides to eschew his traditional party for whatever reason. If he's on the right of the PC Party average, he can take his vote to the Alliance without TOO much discomfort, although he will no doubt notice that the great majority of Alliance members are too far right for him to have a whole lot in common with. Then again, they're likely no more different than those Red Tories he had to tolerate in the old party. Most main-stream Tories who went shopping would be most comfortable voting Liberal as opposed to anything else, and the Red Tories who make up the party's left flank would likely feel VERY comfortable in the Liberal fold, at least policy-wise. These are the Tories that Kevin Taft hopes will take him to the Premier's Office on March 3rd. Some of these leaders are going to survive this election, and begin preparing for the next one starting March 4th. Some will not. But if any of the 3 current opposition parties want to increase the size of their box - their electoral footprint, if you will - they need to remember one important detail: Growing in one direction or the other doesn't just mean adding a few fringe elements to your party in that direction. Sustainable growth means making sure that, as you expand to the left or right, your party's centre shifts sufficiently in that direction that those members on the fringe don't feel compelled to leave. You can only be the "right wing nutjob" of the Liberals, far removed from the centre, for so long before the thought of being a main-stream, readily-accepted Tory starts to get a little more palatable. So, the battle for shoppers is on... Hinman's trying to pry votes for the PC Right, Taft wants them from the Red Tories, Mason wants far left Liberals to jump to the NDP, and Ed'll take anyone who isn't in the NDP, but especially Wildrose supporters upset by the merger (you'll need to offer them electoral reform) and right-of-the-mainstream Liberals who have given up on Taft getting them to the promised land. Ah... I just love shopping, don't you? Posted by Enlightened Savage at 2:09 a.m.